The Vescent Photonics D2-160 high-speed detector has a full 9 GHz bandwidth for capturing beat notes between lasers of different frequencies. Simply overlap the master and slave lasers and launch them into the included multimode fiber for measuring the relative frequencies of the two lasers. 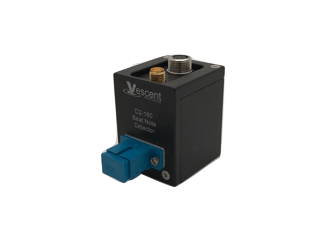 The D2-160 is compatible with both the Vescent D2-250 Heterodyne Module and the D2-135 Offset Phase Lock Servo. In combination, a true phase lock between a pair of lasers, with a user-defined, high-precision frequency offset, can be established. The D2-160 is also compatible with the new ICETM (Integrated Control Electronics) architecture. The D2-160 can also capture fast rising edges of laser pulses for timing, triggering, and pulse synchronization.This digitizing high-speed pre-amplified detector converts an oscillating optical signal (a beat note) into and electrical high/low signal. It works great for measuring beat note frequencies or high-speed timing. It is not suitable for measuring optical power or other amplitude characteristics due to the digitized output. 1The unit ships with an FC/APC to SC/PC multimode fiber which is compatible with the D2-250 Heterodyne Module. The output fiber tip is AR coated. 2In the optical beat note. Since the beat note is delivered through a multi-mode fiber for ease of alignment, the power at the detector is not necessarily the same as the power in the beat note. Damage may occur to the optical element if >1 mW of overall optical power is delivered to the detector.